Award winning actor Shaheizy Sam has a complex role in Interchange, opening in cinemas on Dec 1, as a detective on a mission to find a violent serial killer. “[My character] is driven by logic,” says Shaheizy, 34. While his character may not believe in mysticism, what about Shaheizy himself? 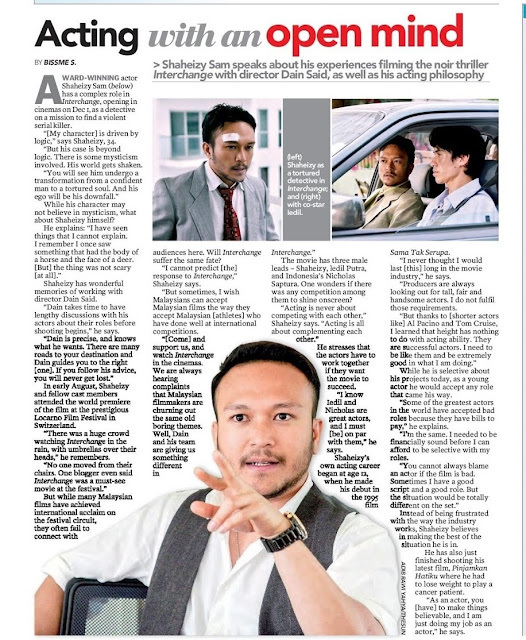 Shaheizy has wonderful memories of working with director Dain Said. “Dain takes time to have lengthy discussions with his actors about their roles before shooting begins,” he says. In early August, Shaheizy and fellow cast members attended the world premiere of the film at the prestigious Locarno Film Festival in Switzerland. “There was a huge crowd watching Interchange in the rain, with umbrellas over their heads,” he remembers. audiences here. Will Interchange suffer the same fate? The movie has three male leads – Shaheizy, ledil Putra, and Indonesia’s Nicholas Saptura. One wonders if there was any competition among them to shine onscreen? He stresses that the actors have to work together if they want the movie to succeed. “I know Iedil and Nicholas are great actors, and I must [be] on par with them,” he says. Shaheizy’s own acting career began at age 12, when he made his debut in the 1995 film Sama Tak Serupa. “I never thought I would last [this] long in the movie industry,” he says. While he is selective about his projects today, as a young actor he would accept any role that came his way. “Some of the greatest actors in the world have accepted bad roles because they have bills to pay,” he explains. Instead of being frustrated with the way the industry works, Shaheizy believes in making the best of the situation he is in. He has also just finished shooting his latest film, Pinjamkan Hatiku where he had to lose weight to play a cancer patient. “As an actor, you [have] to make things believable, and I am just doing my job as an actor,” he say.